An unlikely thing to whisper to yourself before the weekend, perhaps. But at midnight on many Fridays to come, I recommend that you perform a rain-dance. That way, you will have another excuse come Saturday morning to indulge in the 2010 British crime/comedy phenomenon that is 'Sherlock'. How to explain why this TV series turns the best of us into giant, couch-dwelling grubs? Perhaps its refreshing modernity is to blame. Co-creators Steven Moffatt and Mark Gatiss do not attempt to mimic the Victorian London that is the home of Conan Doyle's renowned protagonist, the detective Sherlock Holmes, in this latest take on his adventures. Instead, they revel in the technology and streetscape of modern London, and work the original plots into a texting, taxi-catching environment we can all recognise. This keeps Holmes and his arch-nemesis Jim Moriarty on their toes as their ingenuity is put to the test in new and engaging ways. Surely, though, the series' most unique feature is its sometimes poignant and often hilarious script, as beautifully executed in the performances of its main characters. 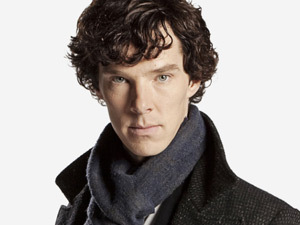 Benedict 'Chiselled Cheekbones' Cumberbatch (alright, the middle bit isn't official) is absolutely perfect as the idiosyncratic detective who horrifies his landlady with his casual refrigeration of decapitated heads; and Martin Freeman (Dr John Watson, Sherlock's sidekick) provides an ideal balance with his almost extraordinary ordinariness. Andrew Scott takes the cake, though, as the self-proclaimedly 'changeable' Moriarty, who stages a spectacular break-in of the Tower of London whilst chewing gum and dancing to ballet music. My only criticism of this series is its length. Six episodes (three for each series, the first of which is available at most ABC shops) hardly seems enough! If all goes to plan, though, a third should be on the cards for early 2013. In the mean time, summon those clouds and snuggle in for some seriously satisfying sleuthing. Why? 'Sherlock' Comes to Your Holmes.